Child labor is the employment of children under an age determined by law or custom. This practice is considered exploitative by many countries and international organizations. 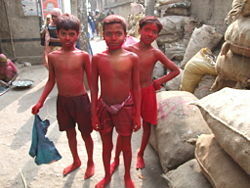 However, sanctions against nations using child labor have been found to lead to even worse conditions for the children. Thus, the resolution of this issue remains contentious as humankind seeks to achieve a world in which the human rights of every person, adult and child, are respected and a life of prosperity is available to all. Child labor, the employment of children under a specified age that is generally within adolescence, can include factory work, mining, quarrying, agriculture, helping in the parents' business, having one's own small business (for example selling food), or doing odd jobs. Some children work as guides for tourists, sometimes combined with bringing in business for shops and restaurants (where they may also work as waiters). Other children are forced to do tedious and repetitive jobs such as assembling boxes or polishing shoes. The most controversial forms of work include the military use of children and child prostitution. Less controversial, and often legal with some restrictions, are work as child actors and child singers, as well as agricultural work outside of the school year (seasonal work). Child labor was not seen as a problem throughout most of history, only becoming a disputed issue with the beginning of universal schooling and the development of the concept of human rights. 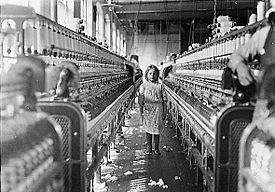 The period best known for child labor is the Industrial Era, where use of child labor was commonplace, often in factories. In England and Scotland in 1788, about two-thirds of the workers in the new water-powered textile factories were children. Subsequently, largely due to the campaigning of Lord Shaftesbury, a series of Factory Acts were passed to restrict gradually the hours that children were allowed to work, and to improve safety. there was a drastic increase in the intensity of exploitation of child labour between 1780 and 1840, and every historian acquainted with the sources knows this is so. This was true in the mines, both in inefficient small-scale pits where the roadways were sometimes so narrow that children could not easily pass through them; where—as the coal face drew further away from the shaft—children were in demand as "hurreyers" and to operate the ventilation ports. In the mills, the child and juvenile labour force grew yearly; and in several of the out-worker or "dishonourable" trades the hours of labour became longer and work more intense. claims of increased misery…[are] based on ignorance of how squalid life actually had been earlier. Before children began earning money working in factories, they had been sent to live in parish poorhouses, apprenticed as unpaid household servants, rented out for backbreaking agricultural labor, or became beggars, vagrants, thieves, and prostitutes (Nutten). The precapitalist "good old days" simply never existed. The pre-factory age was not a time of happy, contented kids. From 1730 to 1740, 75 percent of children in England died before age five. From 1810 to 1829, supposedly the evil age of the factory, infant mortality fell to 32 percent and would continue to drop. Capitalism and the industrial revolution gave youngsters a chance to survive. Laws were passed to prohibit child labor in the industrialized countries; however it is unclear whether this legislation is the principal cause of the decline in levels of juvenile employment. Clark Nardinelli, a neoclassical economist, suggests that child labor was already decreasing in the United States and Western Europe prior to the passage of legislation, due to an increasing demand for educated and literate adults brought about by an increasing technological sophistication of industry. The demand for educated workers also provided an incentive for children to stay in school to meet the new demands of industry. Today, however, rather than in factories and sweatshops, most child labor occurs in the informal sector, "selling on the street, at work in agriculture, or hidden away in houses—far from the reach of official labor inspectors and from media scrutiny." The introduction of compulsory education in most of the Western world led to a rapid decline in the use of official child labor over the course of the nineteenth and twentieth centuries. Child labor is most prevalent in developing countries where access to school is often limited, too expensive, or families are living hand-to-mouth. States Parties recognize the right of the child to be protected from economic exploitation and from performing any work that is likely to be hazardous or to interfere with the child's education, or to be harmful to the child's health or physical, mental, spiritual, moral or social development. Based on this understanding of the use of children as laborers, it is now considered by wealthy countries to be a human rights violation, and is outlawed, while some poorer countries may allow or tolerate it. In many countries, it is considered inappropriate or exploitative if a child below a certain age works, excluding household chores or schoolwork. An employer is often not allowed to hire a child below a certain age. This minimum age depends on the country; in the United States, the minimum age to work in an establishment without parents' consent and restrictions is age 16. However, children as young as four remain employed in production factories with dangerous, and often fatal, working conditions. Poor families often rely on the labors of their children for survival, and sometimes it is their only source of income. This type of work is often hidden away because it is not in the industrial sector. Child labor is employed in subsistence agriculture, in the household, or in the urban informal sector. In order to benefit children, child labor prohibition has to address the dual challenge of providing them with both short-term income and long-term prospects. Some youth rights groups, however, feel that prohibiting work below a certain age violates human rights, reducing children's options and leaving them subject to the whims of those with money. The reasons a child would consent or want to work may vary greatly. A child may consent to work if, for example, the earnings are attractive or if the child hates school, but such consent may not be informed consent. The workplace may still be an undesirable situation for a child in the long run. Child laborer, New Jersey, 1910. Children's participation in economic activity was commonplace prior to the Industrial Revolution as children performed labor on their farms or for their families. Thus, Milton Friedman claimed that the Industrial Revolution saw a net decline in child labor, rather than an increase. According to this theory, before the Industrial Revolution virtually all children worked in agriculture. During the Industrial Revolution, many of these children moved from farm work to factory work. Over time, as real wages rose, parents became able to afford to send their children to school instead of work and as a result child labor declined, both before and after legislation. While accepting that overall child labor declined in this period, other commentators draw a qualitative distinction between domestic work and participation in the wider (waged) labor-market. Friedman believed that the absence of child labor was a luxury that many poor states could not yet afford. To prohibit it is to prevent the economic growth necessary to relieve a society of the need for child labor. In poor societies, these children will be put to work by their families by whatever means because they cannot afford to feed idle and unproductive children. Moreover, in addition to possibly increasing family costs on a depleted family income, parents may have to forgo potential labor time and income, to care for idle children. Some argue that if industrial child labor is legally forbidden, then many children are relegated to working in more dangerous black market occupations such as prostitution. Concerns have been raised that efforts to end child labor by boycotting products manufactured through child labor may force the children to turn to more dangerous or strenuous professions, such as prostitution or agriculture. For example, a UNICEF study found that 5,000 to 7,000 Nepalese children turned to prostitution after the United States banned that country's carpet exports in the 1990s. 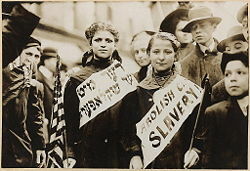 Also, after the Child Labor Deterrence Act was introduced in the U.S., an estimated 50,000 children were dismissed from their garment industry jobs in Bangladesh, leaving many to resort to jobs such as "stone-crushing, street hustling, and prostitution,"—"all of them more hazardous and exploitative than garment production." The study concluded that boycotts are "blunt instruments with long-term consequences, that can actually harm rather than help the children involved." Two girls wearing banners with slogan "ABOLISH CHILD SLAVERY!!" in English and Yiddish. Probably taken during May 1, 1909, labor parade in New York City. Concern has been raised about the public's moral complicity in purchasing products assembled or otherwise manufactured in developing countries with child labor. The cocoa industry has been under consistent criticism for years over child labor in West Africa, especially Côte d'Ivoire. In July 2005, the International Labor Rights Fund filed suit against the Nestle, Archer Daniels Midland, and Cargill companies in Federal District Court in Los Angeles on behalf of a class of Malian children who were trafficked from Mali into the Ivory Coast and forced to work twelve to fourteen hours a day with no pay, little food and sleep, and frequent beatings. The three children acting as class representative plaintiffs had to proceed anonymously, as John Does, because of feared retaliation by the farm owners where they worked. The complaint alleges their involvement in the trafficking, torture, and forced labor of children who cultivate and harvest cocoa beans which the companies import from Africa. Chocolate manufacturers were given a 2005 deadline to end the use of child laborers, but they failed to meet the deadline, which was then extended to 2008. Though children's labor may be necessary to the survival of some families, it does not represent the ideal for children or their family. Putting children to work too early can stunt their development socially and educationally as well as expose them to physical risks. This does not even factor in the daily peril faced by children working as prostitutes or soldiers. Movements for universal education and for the end to child labor seek to better serve children and provide the opportunity to escape poverty through education, which ultimately benefits both the individuals and society as a whole. ↑ Douglas A. Galbi, Child Labor and the Division of Labor in the Early English Cotton Mills. Retrieved on April 15, 2007. ↑ E. P. Thompson, The Making of the English Working Class (Penguin, 1968), p. 366-7. ↑ Robert Hessen, "Capitalism," Concise Encyclopedia of Economics. ↑ William Anderson, Kathie Lee's Children. Retrieved November 1, 2007. ↑ Clark Nardinelli, Child Labor and the Industrial Revolution (Indiana University Press, 1990). ↑ UNICEF, The State of the World's Children 1997. Retrieved April 15, 2007. ↑ International Labor Organization, Worst Forms of Child labor Recommendation, 1999. Retrieved October 5, 2006. ↑ Office of the United Nations High Commissioner for Human Rights, Ratification of the Convention on the Rights of the Child. Retrieved October 5, 2006. ↑ Milton Friedman, Take it to the Limits: Milton Friedman on Libertarianism. Retrieved March 11, 2008. ↑ Thomas R. DeGregori, Child Labor or Child Prostitution? Cato Institute. Retrieved May 25, 2007. ↑ Hugh Cunningham, The decline of child labour: Labour markets and family economies in Europe and North America since 1830, Economic History Review, 2000. ↑ Humphrey Hawksley, BBC News (April 2, 2007), Child cocoa workers still "exploited." Retrieved April 15, 2007. All links retrieved February 11, 2017. Photographs of Child Labor in America 1908-1912 History Place. The Morality of Child Labor by Sam Vaknin. The State of the World's Children - a UNICEF study . This page was last modified on 11 February 2017, at 15:53.